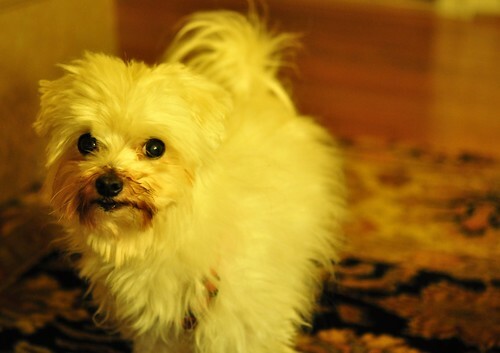 I may have to face the fact that my little Maltese Rocky is slowing down. I just can’t believe he’s 12 now–he looks like a puppy. Total strangers tell me that all the time. The Maltese looks like a puppy longer than any breed. Here’s my little guy…. My baby doesn’t like going up and down stairs anymore now. I usuallly carry him because he’s had back problems in the past. It is going to kill me when Rocky goes. This dog was with me during the divorce and moved all the way across the country when I remarried. Stuffed into a cramped carrier under the airplane seat for over six hours! He also survived a rattlesnake bite. And I should add that I adopted him from a rescue group because he was found on the streets. A tough little guy, but not immune to aging, alas. Rocky is totally devoted to me: he’s either on my lap or at my feet. I’m just going to enjoy the time I have left with him and appreciate his being there when I was going through the worst time of my life. This entry was posted in dogs, Maltese, photography and tagged Maltese dog. Bookmark the permalink.